Line 13x9-inch pan with parchment, with ends of parchment extending over sides. Microwave chocolate and butter in large microwaveable bowl on HIGH 3 min. or until butter is melted. Stir until chocolate is completely melted and mixture is well blended. Whisk eggs, 2 cups sugar, coffee and vanilla in large bowl until blended. Stir in chocolate mixture. Add flour and baking powder; mix just until blended. Stir in 3/4 cup nuts. Pour into prepared pan. Bake 45 to 50 min. or until toothpick inserted in centre comes out with fudgy crumbs. (Do not overbake.) Cool completely. Meanwhile, cook water, corn syrup and remaining sugar in medium saucepan on high heat until mixture comes to boil and sugar is dissolved, stirring constantly. Reduce heat to medium; cook 8 to 10 min. or until mixture is deep amber colour and registers 350ºF on candy thermometer. (Do not stir.) Remove from heat; cool 1 min. Slowly add cream, stirring after each addition until blended. Whisk in sour cream. Cool to room temperature. 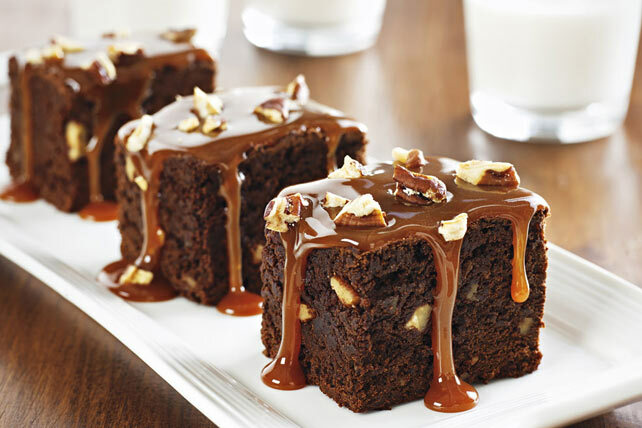 Pour caramel sauce over brownies; spread to cover top. Sprinkle with remaining nuts. Refrigerate 2 hours. Use parchment handles to lift brownies from pan before cutting to serve. Since this indulgent recipe makes 32 servings, it's the perfect dessert to serve at your next party. Use foil to line the baking pan instead of parchment. Sprinkle brownies with 2 to 3 tsp. flaked sea salt before refrigerating as directed.